U.S. #4806a – A 2013 Inverted Jenny printed with the original dies. 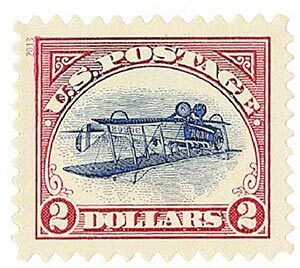 On May 14, 1918, stamp collector William Robey discovered the now sought-after Inverted Jenny, #C3a. 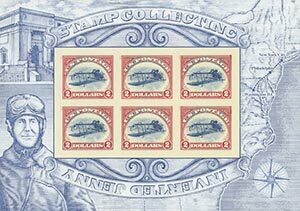 The Bureau of Engraving and Printing was in a rush to produce America’s first airmail stamp. Because the stamps were to be bi-colored, each sheet would be fed through the press twice – once to print the red frame and a second pass to print the blue vignette. In the rush, nine of the 20,000 sheets printed had been hand-fed through the printing press upside down. The mistake created an inverted vignette and positioned the plate number on the bottom selvage. At some point, eight sheets were found in the BEP office and destroyed. However, a single sheet made its way to the New York Avenue post office branch in Washington, DC. Stamp collector William Robey eagerly awaited the first airmail flight. The young Washington, DC, resident planned to exchange covers with special “first trip” postmarks with fellow collectors at the other two points of the tri-city route. U.S. #4806 – The selvage pictures the National Postal Museum, aviation pioneer Reuben H. Fleet, a map of the first scheduled Air Mail route, and a compass rose. Some of Robey’s recollections grew fuzzy over the years, but many essential facts are clear. The young office clerk withdrew $30.00 from his bank account, a figure equal to more than $1,500.00 in today’s wages, to purchase a full sheet of the new stamps. Item #C3a Repro – A reproduction of the Jenny Invert sheet. Shortly after noon, Robey entered a branch of the post office in Washington, DC, and asked for a sheet of 100 of the 24¢ airmail stamps. 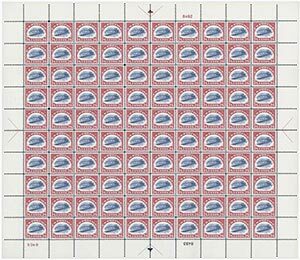 When the unknowing clerk placed the sheet of inverted stamps on the counter, Robey said his “heart stood still.” After paying for the sheet without comment, Robey asked the clerk if he had additional sheets. The clerk apparently realized something was amiss, closed his window, and contacted his supervisor. Robey’s search of other post office branches was unsuccessful. He returned to his office and shared his news with a fellow stamp collector, who immediately left the office to search for more error sheets. His activities alerted authorities, who arrived at Robey’s office less than an hour after he returned from the post office. The officials threatened to confiscate the sheet of inverts, but Robey stood firm. U.S. #4806b – Imperforate 2013 Inverted Jenny sheet. 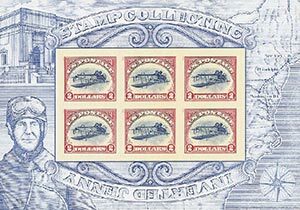 Alerted to the error, authorities immediately halted sales of the 24¢ airmail stamp in Washington, DC, Philadelphia, and New York City as they searched branch offices for other sheets. Robey’s actions in the hours following his discovery suggest that he never considered keeping the inverted stamps. Instead, he contacted Washington stamp dealer Hamilton F. Coleman immediately. Coleman offered to purchase the sheet for $500.00 – an amount equal to more than $26,500 today. Robey declined the offer. Robey’s decision was a gamble. The value of any particular stamp is based on the law of supply and demand. Although errors in general – and inverts in particular – are highly valued, the extent of the BEP’s error was unclear that afternoon. Item #M11292 – 2013 Inverted Jenny Collector Kit (click the image to see what it includes). After riding around on streetcars for hours pondering his options, Robey slipped into his apartment under the cover of darkness. Mindful of the government threats and the potential value of his stamps, Robey and his bride slept with their newly found treasures hidden under the bed. 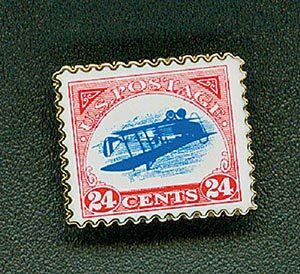 Because the 24¢ airmail stamps were still in production, the BEP reaction to the news of an invert was swift and certain. On May 15th, new procedures were implemented to prevent further printing errors. Shortly thereafter, still another change was made to reduce the risk. Each “generation” can be distinguished from the others by the selvage and its characteristics. Item #LS180 – Inverted Jenny Lapel Pin. Meanwhile, William Robey raced to sell his stamps before the government made good on their threat to take them. He spent several days contacting and visiting stamp dealers. In the end, he sold the sheet to Eugene Klein. He sold the sheet that he bought for $24 to Klein for $15,000 – a 62,500% profit over the purchase price! Days later, Klein would sell the sheet to Colonel Edward H.R. Green for $20,000. They broke up the sheet and numbered each stamp, which then allowed four generations of stamp collectors to trace the ownership of each stamp. In 2005, Mystic became the proud owner of the Inverted Jenny Plate-Number Block. 5 Responses to "This Day in History… May 14, 1918"
I don’t seem to have this in my collection; just an oversight, I guess. I’m explaining to my family that each stamp is a story on to itself and no just a “sticky thing” that fills a void in a collection. Fascinated since a child and forty years have a nice, not large collection of mint stamps. Today most lottery winners seem to spend all their money very quickly. But, I remember reading that Robey purchased a house and even financed his daughter’s wedding years later. I’m still amazed that Robey was specifically looking for an error sheet. What were the odds that he would be the one to find it – the only one? Really only one sheet, thought there were more ! Robey scored and knew how to make his good luck pay off, good for him. After news of Robey’s discovery became public the Post Office Department stopped selling the airmail stamps and inspected all the sheets. They found 9 or 10 additional sheets with plane inverted and destroyed them. Too bad for collectors but the POD was embarrassed to have an error for their new service.